Shanghai Seven Trust Sale Courtyard Wood Plastic Composite (WPC) Pergolas have a traditional wood appearance with composite technology is a unique composite formula that is eco friendly and long life span product. it not only durable and strong, but also weather resistance and no fade. they require little maintenance and will not splinter. The material is UV resistance, with a 100% recycled material ,color stable and withstand climates far better than traditional timber materials. The combination of a beautiful traditional wood appearance and long lifespan makes WPC Pergolas the obvious choice for new or replacement projects. they have different specifications and style. will be able to increase the value of your home with a courtyard composite timber pergolas. 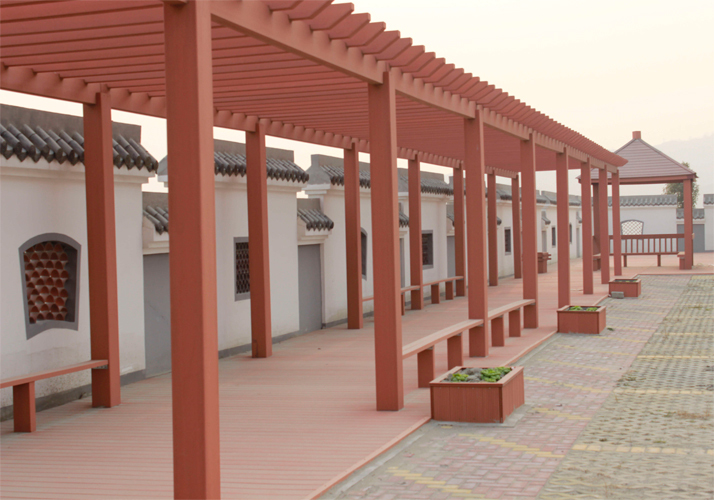 our company sale composite wood pergola with high quality and have quality assurance , meanwhile, have reasonable price price and best product. Although timber has been used for Pergola construction for decades we are all aware of its shortcomings. For the first few years timber works well. However, after a period of time, timber, however treated, will start to deteriorate due to exceptional high temperatures. in order to overcome these safety and long-term durability issues, many commercial operators are insisting on using composite timber pergolas as a long-term investment, in fact composite wood Pergolas have an expected lifespan of 20 years. and due to seven trust as profession sale courtyard composite timber pergolas manufacturer , we will satisfy different customer needs, providing personal customer tailor. At last , composite timber pergolas for you courtyard can make you house more and more beautiful, if you want to buy it , please contact us as soon as possible.